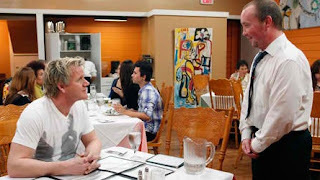 In this Kitchen Nightmares episode, Chef Gordon Ramsay visit's Kingston Cafe, Pasadena, California, owned by radiologist and Olympic athlete Dr Una Morris. She runs the restaurant managing every aspect, the servers are in shirts and ties. Gordon meets Keone and he tells her it is his mothers management style that is the biggest problem. Gordon nearly drives by as it is not clear it is a restaurant. He arrives and sits down, Una reveals that she does everything even designing the menu. Gordon orders Jamaican patties, jerk chicken and Oxtail. The patties are gross, soggy and doesn't like the sauce, the chicken was dry and overcooked and the oxtail full of fat. Keone tells Gordon that he thinks everything should be cooked fresh but Una says it is meant to be dry, Gordon tells her it was inedible. They argue and Gordon leaves. Gordon returns for a dinner service. As the orders come in complimentary salads are sent out in martini glasses and Gordon is not impressed. Gordon takes a look through the fridges and discovers that everything is in plastic bags. Gordon visits Una at her medical practice and tells her she is in denial and needs to make big changes. She says she has put in her last $300,000 and can only last another month. He sits down Keone who admits he is not as committed as he was and tells him to focus on family first. Gordon introduces a special BBQ menu with meat and fish cooked by Keone but in the kitchen they are still using the bags and day old rice and beans. The customers love the BBQ but are left waiting in the dining room. Gordon brings in a wheelbarrow of plastic bags and dumps them on the floor. Overnight, the restaurant is transformed and a new sign is introduced out the front. The old menu is replaced with fresh Jamaican dishes and the staff are to wear t shirts. On relaunch night, it starts to go well with appetizers going out quickly. Soon, the tickets pile up, chef Daniel gets behind and the quality drops. Gordon takes Keone aside to tell him to step up, Dr Morris comes in arguing with him and Gordon tells her to let him find his voice. The kitchen gets back on track and most customers are pleased with the relaunch. Gordon praises Keone on his work but has a private chat with Dr Morris where he tells her to let Keone be more involved or let him go. Gordon revisits and meets Una, he finds out that Keone is no longer involved as he is focusing on his education. She has fired all the chefs and the serving staff and rehired. Gordon says the food is fresh, delicious and more spicy. Gordon meets new chef Christie and Una is very appreciative of Gordon's help. Yelp reviews and Trip Advisor reviews are very mixed after the show. The restaurant closed in November 2012 BUT reopened in November 2013, with a new dance floor, some new menu items, the old, themed nights and an expanded bar. They reduced the opening hours to evening service on Thursday, Friday and Saturday. Kingston Cafe closed as a restaurant in August 2018, they plan to use the building for catering and events. Kingston Cafe aired on April 15 2011, the episode was filmed in January 2011 and is Kitchen Nightmares season 4 episode 8. People like that owner though are annoying as hell. They think they're above everybody else because they have a doctorate and usually think they're experts at everything. Yeah, until, they know... save your life. I think the woman is a nice person, and that was confirmed when she broke down & cried. Just because someone acts tough does not mean they are automatically bad. She had to be tough to survive losing her mom as a child, to be an olympian, to drag herself through school to become a radiologist. She's to be admited not hated. She is NOT A LIFESAVER!!!! She reads x-rays and confirms musculoskeletal injury. Hardly a lifesaving endeavour. If I went into cardiac arrest, I would rather have an EMT working on me than a radiologist. And I have a background in the medical field. "She is NOT A LIFESAVER!!!! She reads x-rays and confirms musculoskeletal injury. Hardly a lifesaving endeavour. If I went into cardiac arrest, I would rather have an EMT working on me than a radiologist. And I have a background in the medical field." Oh yeah, if she finds a TUMOR in your x-ray, that's not saving your life at all. Because anyone can just read an x-ray, right? Little snot. An EMT is someone who has passed a 120 hours course. Try doing only the half that woman has already accomplished, then tell me. Although I did feel sorry for her she was continually immensely arrogant. I felt more sorrow for her bullied son. Kingston Cafe's owner, Dr. Una Morris, isn't a culinary genius, but give the lady credit where it's due. Professionally, she's a Board-Certified diagnostic radiologist with California residencies completed in both radiology and general surgery. She's a graduate of UC-San Francisco, one of the world's leading medical schools and medical research institutions. Bear in mind that radiologists must excel math and physics. They can't be equated with EMT's as someone stupidly stated earlier. Perhaps,I am judging her too harshly, but she seemed very mean, arrogant, phony, and just completely rubbed me the wrong way. I hope I am wrong about her. I felt bad for her son. So...is it only open on certain days now? I am just confused since it's saying it's only open on weekends. Is it because of a doctor thing or is the owner not feeling well? Have you not met doctors? Doctors who have gone through 4 + years of medical school + 2 plus years of residency, who are trained to be on the cutting edge of Medicine are all stubborn in their own way. It's hard for them to break their habits. Not saying it's impossible, it's just hard for some Doctors to come around. Kingston looks like it has come around since she was able to take a good look at herself as GR always says.